When the release of The Lost Prince was announced, I didn’t quite know what to think about it. In ninety percent of the cases, a spin-off isn’t the best idea an author can have and it ends up disappointing the fans. While I wasn’t the biggest fan of The Iron Fey in the world, I still enjoyed the series and I didn’t want it ruined in some sad attempt to milk the cash cow. Now, after reading the first book, I’m very excited that Ethan’s (and I suppose Keirran’s) story is being told. As usual, what bothered most reviewers is actually what I enjoyed the most. Ethan is very angry; at himself, at his life, his parents, but above all at Meghan for abandoning him and deciding to cut all ties to her human family. The way he sees it, she is the Iron Queen now and she doesn’t need Ethan or the problems he inevitably brings. Being inside his head was interesting to say the least, and I thought it was done really well. I suspect that’s exactly how I’d feel and behave in Ethan’s shoes. 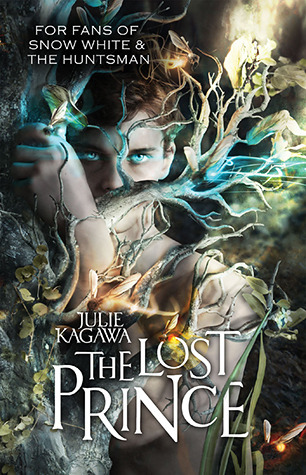 I honestly didn’t thing Kagawa was capable of writing a book without a love triangle, but even though I expected it, there wasn’t one in The Lost Prince, which is probably part of the reason I liked the book as much as I did. I loved Kenzie and Ethan’s relationship, they are definitely a couple I can get behind. Even with all their problems, they are both better people around each other and there’s this wonderful chemistry between them that makes my heart flutter every time. Unfortunately, I can’t say the same about Keirran and Annwyl, I just didn’t feel any sparks there. Since I know Kagawa is excellent at writing swoony romances, I can only assume this was done on purpose. Keirran is the primary source of suspense, at least once you try to look at the big picture, and through him, Kagawa manipulates her readers splendidly. As much as I wanted to like him, I was never quite sure where he stood, and as sincere as he seemed, there were always doubts at the back of my mind. I don’t want him to turn bad, mostly because of who he is, but I fear that it’s inevitable. Once again, Julie Kagawa simply excels at worldbuilding. Nevernever is just as rich and imaginative as before, if not more. She always paid attention to detail and this time is no different. I’m not usually one for long descriptions, but Kagawa has a talent for creating vivid images with no more than a few carefully chosen words. It was old, even from a distance, I could see that. Stone walls and mossy roofs, vines coiled around everything. Trees pushing up through rock, roots draped and curled around stone. Some of the buildings were huge – massively huge. Not sprawling so much as they looked as if they were built by a race of giants. Here comes the real shocker: I ended up liking The Lost Prince even more than I liked the original series. Lack of a dreaded love triangle probably contributed to that fact. If Kagawa continues following her usual pattern, this series will only get better. Considering how much I already like Kenzie and Keirran, and how much I’ve warmed up to Ethan, it seems I really have something to look forward to. More, please! I'm glad you enjoyed this, Maja! I liked it too, but I know it has been splitting readers, so I was worried you wouldn't. Kagawa is just brilliant at world-building - I completely agree with that. It was one of my favourite things about this book (and the Iron Fey books, too). And it's an interesting point you make about Annwyl and Kierran. I never did pay their romance much attention. Actually, if I'm being completely honest, I forgot who Annwyl was for a minute there. She isn't the most memorable character. I'm glad you enjoyed this. I have the Iron fey still to read, which I now possess them all to do so, which I'm excited about. I also have a copy of this too.. So I can't wait to read them all. Brilliant review, Maja. And I hope you continue to enjoy the series. I really appreciated the lack of that darned triangle. It left the focus on Ethan and Kenzie, two very interesting characters. And the worldbuilding, as always, was fabulous. I liked world building in the Iron Fey series, but couldn't really get in with the mc so I gave up half way through book 2. Ethan sounds like a mc I could get on with and I'm glad there is no love triangle as I'm not a fan of those. Great review. The only books I have read by this author is Immortal Rules and end of Eden the novella. I am glad you enjoyed aspects of this, I hope to read both series one day! Btw, I love your cover so much more than ours. I agree I loved that there was no love triangle and I really liked Ethan as well. He was such a departure from Meghan who drove me nuts with her whining and crying all the time. I was not a fan of the ending though....However, I truly admire Kagawa's world building! I never finished the other series because I didn't really care either way. I'd have to restart them if I went back as I barely remember any of the plot. But this sounds like it might be more up my alley. Can someone like me jump into it without remembering any of the original source material? You know, I really did like the world building in the Iron Fey series too, but I definitely know what you mean about the love triangle. I still haven't managed to start the last book in the series because I had problems with Meghan's main love interest being so stereotypical of YA paranormal romance (tall, dark, mysterious, and angsty). I'm glad to hear that the spin-off is love triangle-less. It gives me hope!